Role > Helped develop identity for Colors. Set up files for 20 different hair colors. Assembled and performed color correction on all images in Photoshop. Flowed and corrected text in QuarkXPress. Developed Illustrator framed illustrations for hair color comparisons. Hand-mocked up color comp boxes for client approval. and flowed text into each package. Objective/purpose > The objective was to sell various hair color products in the African American hair care market for Revlon. 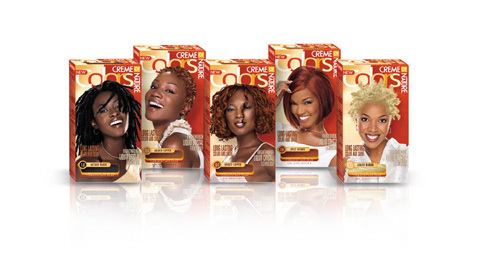 This new product was a bold new move into more dramatic hair colors, the packaging needed to reflect this trend. Results > This bright packaging pops on the shelves next to its counterparts. It speaks to the market and successfully distinguishes the product as unique.